When it comes to organic lawn care and gardening you hear things that sound downright crazy. 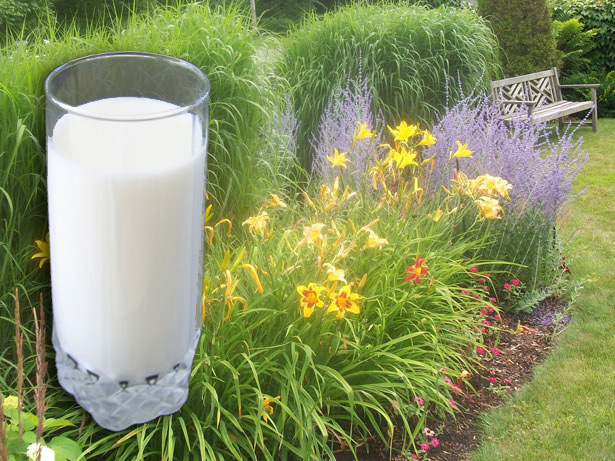 One of the more odd suggestions is to use a diluted milk spray on your lawn and plants to help treat and prevent fungus and other plant diseases. Years ago when I first read about using milk in the garden, not much was known about how milk fights plant pathogens but a lot has changed since then. Some people have had great success with milk sprays and other people, not so much. I'm putting this article together to share what I've learned regarding milk sprays and plant disease to give you a better understanding to increase your chances of success. Over the years I've been taking a peek at some of the research and it's all starting to make sense so here's a more complete picture on the how and why to use milk in your garden. Before we get to the boring stuff, here's how to make it. The recommendations I've seen is to use 1 parts milk to 9 parts water. Use skim or non fat milk because the fat in milk is what goes rancid and smells. Some of the studies have shown varying results but regular, skim and dry nonfat milk powder have all shown positive results. Below is a table showing the amount of milk, or dry milk powder necessary to make a 1:9 diluted milk spray for the common spray methods I use. They're not exactly 1:9 but are easier to mix in the different sprayers. Most municipal water is treated with either chlorine or chloramine which kill microorganisms in the water supply. For our milk spray we want to neutralize both so they don't harm the beneficial bacteria in the milk. Humic acid can neutralize these compounds. Supposedly one teaspoon of humic acid liquid can neutralize chloramine in 100 gallons of water. For a 2 gallon milk spray one or two drops should do it. Humic acid is good for your plants and soil and is commonly used in commercial inoculant mixtures so I don't think there will be a problem adding more. If you have a dehumidifier you can also use the water from the drip tank since it's basically distilled water. Distilling municipal tap water does remove chlorine but not chloramine. Keep in mind that milk powder comes in instant and non-instant varieties. The instant type is a little more expensive but dissolves easier which will keep your sprayer nozzles from clogging. You want to begin applications before there are any signs of disease. If you routinely experience issues with plant disease season after season just assume you're going to have issues and start spraying to help prevent it. Spray your plants so that you thoroughly coat the plants on all surfaces with a light misting of spray. Repeat the every 7-14 days. More or less often depending on conditions and how much disease pressure you'll likely have. You should start spraying around early spring once your garden starts to come out of winter dormancy. Try not to spray when temperatures are above 80 degF. Avoid this by spraying early in the morning, late at night or when the sky is overcast. Why are fungicides better at preventing disease? Many opinions and reports I've read indicate that fungicides aren't as effective at treating a disease as they are at preventing a disease. My understanding is that while a treatment may effectively eliminate pathogens from a plant the damage caused to the plant is not cured simply by killing off the pathogens. In most cases when we see a plant disease, we're not actually seeing the disease, we're seeing the effects of the disease. Plant pathogens damage the cells of plants as they rob them of moisture and nutrients in the spring when most diseases begin to infest plants. Once the summer hits the added stress of the heat and lack of water intensifies the damage caused by the pathogens producing the visible markings we might see. There are ways to help deal with that stress but ultimately we want to try and prevent that damage from occurring. So spray early and spray often. It looks like there are three things that likely contribute to the suppression of plant disease by using milk sprays. Calcium, beneficial bacteria and amino-acids. When I first heard about using diluted milk sprays one of the likely explanations to its effectiveness was providing calcium to the plants. Calcium helps plants fight disease, more likely a calcium deficiency makes plants more susceptible to disease. There have been a number of studies on this including this paper, Calcium Nutrition Affects Resistance of Tomato Seedlings to Bacterial Wilt. Milk, even pasteurized and powdered, contains a wide assortment of beneficial microorganisms which can help fight plant pathogens. Much how probiotics has become a buzzword of late and we're all eating more yogurt to get beneficial bacteria, plants can benefit in the same way. Three such microorganisms that have been found in milk which fight plant pathogens are bacillus coagulans, bacillus subtilis and trichoderma. I had discussed trichoderma in relation to treating lawn disease with corn meal previously. It's a fungus that attacks and kills other fungi. There are a number of products on the market. RootShield Home and Garden is the only product I've seen that is sold to consumers that contains only trichoderma as an active ingredient. It is an EPA registered pesticide and has also OMRI listed for organic farming. Bacillus subtilis has been studied and shown to be effective for a large array of plant diseases. Here is one study on the benefits of bacillus subtilis against fusarium wilt on tomato plants. There is even a commercially available product called Serenade Disease Control that contains bacillus subtilis as it's active ingredient. It is an EPA registered fungicide that has been approved for organic farming. Bacillus coagulans is new to me. It is a bacteria commonly found in milk that was previously classified as a lactobacteria. It has shown to be effective at control plant pathogens in a number of studies including Antifungal Activity of Bacillus coagulans TQ33, Isolated from Skimmed Milk Powder, Against Botrytis cinerea and Purification and characterization of antifungal compounds from Bacillus coagulans TQ33 isolated from skimmed milk powder. But are these microorganisms available in your milk and are there enough of them? I don't really know and this might explain why some have had varied experiences. There are products you can buy that contain many beneficial microorganisms. In the past I used to use a product called Organica Plant Growth Activator Plus which contained many beneficial microorganisms including bacillus subtilis and trichoderma but unfortunately it looks like it's no longer in production though there are some tubs still available through Amazon. It's a real shame because this seemed like the perfect organic foliar spray. Right now I'm looking into Humboldt Nutrients Myco Maximum which contains many of the same microorganisms but is lacking in bacillus subtilis. I have to admit, this is a bit of speculation on my part. Amino acids are the building blocks of proteins which contribute to the health of living things such as plants and animals. Milk contains lysine, cysteine and tryptophan. Just like proper nutrition can help us resist stress, damage and disease, it follows the same would be true for plants. What are your thoughts and experiences using milk sprays in your lawn and garden? Milky Spore Dispenser - On a Stick!